I got a Vitamix for Christmas guys.. *screaming with excitement* Now I haven't really had time to do a lot with it except make these cookies and extremely large smoothies. But I can already tell that tons of amazing recipes will be created with it. Get excited! I will do a review/comparison of my Vitamix and Ninja. But we all know who will win that contest already. Anyways, I hope you all had a great holiday if you celebrate, and if you don't then I hope you had an awesome day anyways! I can't believe that it's over already. The week between Christmas and New Years is always so strange. But I like the strangeness of it all. Everyone just kind of hangs out and waits for the upcoming year, preparing their New Years resolutions and eating lots of food. I almost wish every day was that way. You know? These cookies are just like eating cookie dough straight out of the bowl. Which is something I used to do every chance I got. But these cookies vegan, obviously, which means that you don't have any risks that you'd have with eggs. Ah, the relief, right?! In a blender or food processor combine cashews, 3/4 cup oats, vanilla, coconut sugar, and salt. Blend until soft dough is formed. 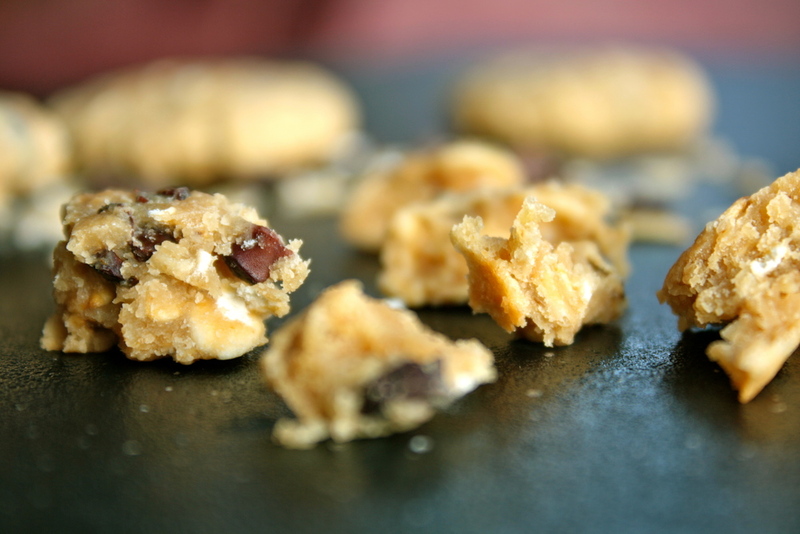 Remove from blender and stir in remaining 1/4 cup oats and chocolate chips. Roll into 10-12 medium sized balls. Place in refrigerator for 30 minutes. Remove and flatten if desired. Serve, enjoy! Keep in refrigerator for up to 7 days.